The Northwestern Medicine Kishwaukee Hospital Medical Records Department is located at 2731 Sycamore Road, between the Northwestern Medicine Home Care, Hospice and EMS office building and Kishwaukee Hospital. The building is accessible by using on-campus drives and has convenient parking in front of the building. The Medical Records office hours are Monday – Friday, 8:00 am – 4:30 pm. Northwestern Medicine Kishwaukee Hospital is home to a specialized joint center and spine center as well as a breakthrough breastfeeding center. The Breastfeeding Center provides donor milk to at-risk infants and is one of the first locations of its kind in Illinois. Each of the centers is located in a designated wing of the hospital and all provide spacious private rooms for patients and their guests. Private rooms are proven to not only improve patient outcomes and encourage a closer, more collaborative relationship with the care team, but also provide additional ease and privacy for patients and their families during a stressful time. 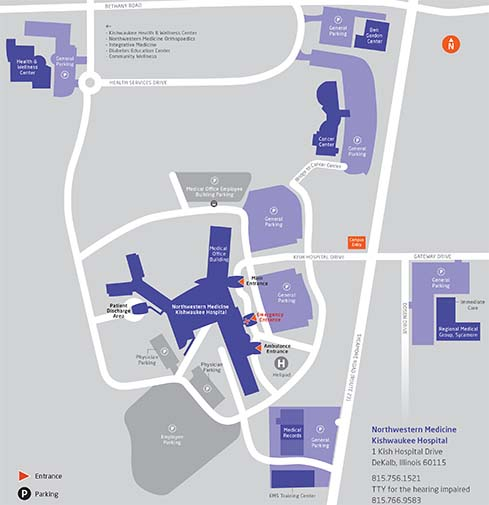 Northwestern Medicine Kishwaukee Hospital is equipped with latest advances in surgical imaging services, meaning patients can rest assured knowing that most tests their care team prescribes can be performed close to home in DeKalb County. The Bluhm Cardiovascular Institute at Kishwaukee Hospital offers the unique blend of academic medicine and clinical research in a community hospital setting. The cardiovascular experts include the specialties of cardiology, interventional cardiology and heart failure.